We’ve partnered with Bosch to share clever tips and tricks that’ll help you get the most out of your kitchen every time you cook. When it comes to roasting chicken, Bosch’s Side-Opening Oven ensures easy, even cooking. Roast chicken is my everything staple: weeknights, dinner parties, cozy weekends, and not-sad desk lunches. My go-to, never-fail method comes courtesy of Barbara Kafka, a James Beard Award-winning cookbook author and food writer. 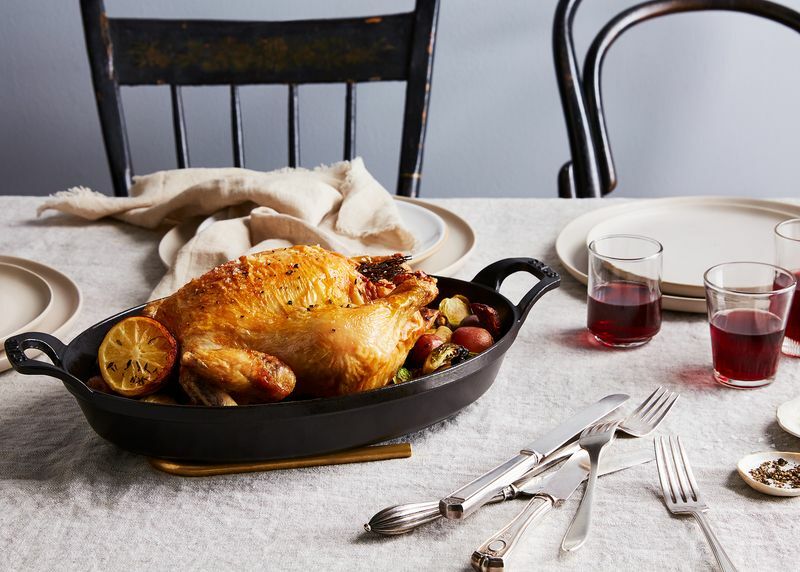 Her genius roast chicken recipe changed the game for me with its emphasis on small but important details, like a super-hot oven (hello, crispy skin) and simple, effective seasonings (join the party, tender and flavorful meat). Thanks to a bit of experimentation as well as some expert advice, there are a few additional tricks I keep up my sleeve, too. Check them all out below, and you’ll be well on your way to a perfect roast bird. For the crispiest skin, dry the bird before roasting. The super hot oven in Kafka’s method helps you get there, but Food52’s Ella Quittner suggests an extra step for extra crunch: “Leave your chicken out uncovered in your refrigerator the night before you plan to cook it. This allows the skin to dry out, so it gets extra crispy when you roast it.” Don’t have all night? You can pat the skin and cavity dry using a paper towel or even blow a hair dryer on the skin before roasting. Or you can try the spatchcocking method. Avoid the whole trussing debate altogether by spatchcocking—aka splitting down the back bone and flattening—your chicken instead. “You’re raising the legs up and putting them on the same level as the rest of the chicken so that it all cooks through evenly,” says Quittner. Don’t skimp on the s&p—especially the salt. Don’t be shy now—aside from adding flavor, salt actually draws moisture from the exterior (yielding an extra-crispy skin) while locking moisture in the meat, making it even juicier and more flavorful. Rub herbs and garlic underneath the skin. For an extra boost of flavor, Quittner suggests adding garlic, mixed herbs, olive oil, butter, and other seasonings in the mix. Just cut a few slits in the skin of the bird, stuff the ground-up mixture underneath, and rub it in. Don’t worry about exact measurements—this is a great opportunity to freestyle (and it’s pretty much impossible to go wrong if you choose flavors you know you like). Stuff the bird with aromatics. “If you don’t spatchcock the chicken, make sure you always stuff the cavity with aromatics, like halved lemons, blood orange wedges, shallots, a quartered onion, celery leaves, herbs, and garlic,” says Quittner. Barbara Kafka is on the same page, and her recipe suggests that you shouldn’t be afraid to think outside of the box. Don’t over—or under—cook your bird. “You know your chicken is done when the juices run clear,” says Quittner. An easy way to know for sure whether or not it’s cooked thoroughly is to use a meat thermometer; the safe internal temperature for a whole roast chicken is 165°F, according to FoodSafety.gov. To get that cooking time just right, I follow the guidelines in Kafka’s recipe: 10 minutes per pound of chicken at 500°F in a normal oven, and 450°F in a convection oven, which distributes heat more evenly around the food. Let a mix of veggies soak up the drippings. For an no-effort side dish, Kafka’s recipe suggests adding hardy vegetables like quartered shallots, sliced carrots, halved fingerling potatoes, or cipollini onions to the pan so that they cook in the schmaltz as it drips off the chicken (this also prevents any smoke or sputtering while roasting). Just make sure not to overcrowd the pan with vegetables or other ingredients: “It will slow down the cooking time and prevent your veggies from getting crispy,” Quittner says. We’re firm believers in the fact the difference is in the details, and that little things can make a big impact—like Bosch’s side-opening wall oven. The oven’s convection roast mode offers 25% faster cooking and ensures the crispiest skin, while the side swing door is ideal for easy accessibility for large roasting pans.